Jakarta (VNA) – Party General Secretary Nguyen Phu Trong visited Indonesia’s Centre for Strategic and International Studies (CSIS) in Jakarta, where he delivered a speech on the 50 years’ path of ASEAN formation, development and future road. 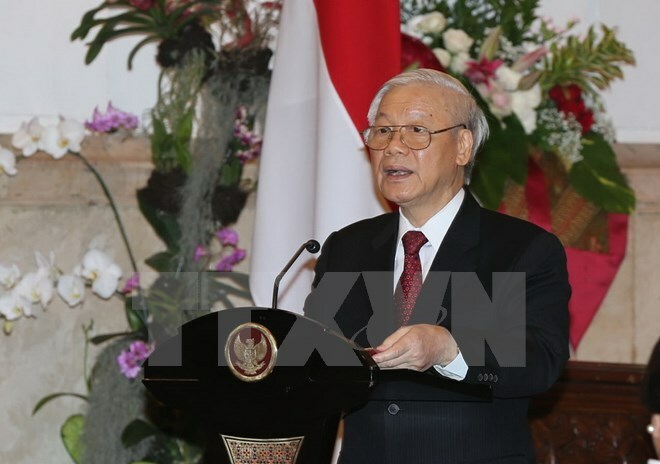 The Party leader recalled the traditional friendship between the two countries from the 19th century when the Nguyen Dynasty of Vietnam send the first envoy to Indonesia to boost trade ties. The relationship has been nurtured and developed. In 2013, the two countries became strategic partners. Vietnam and Indonesia are members of ASEAN with many shared interests and similar values, he said, stressing the important role of the bloc as one of the most successful organisation in the world and a dynamic economic regionranking seventh in the world. The building of the ASEAN Community towards a united and solidarity bloc not only benefits member countries but also other outside states, he said. The Party chief analysed challenges facing ASEAN, while pointing out lessons helping the association succeed over the past 50 years, including those on dependence, and self-reliance, solidarity and unity as well as the central role in regional cooperation mechanisms. In order to realise the ASEAN Vision 2025, he highlighted the need for the association to successfully build the ASEAN Community of solidarity, strength and prosperity, maintain and reinforce regionalpeace and stability, and strengthen partnership with outside partners while promoting the central role of the bloc in the regional architecture. Over the past 22 years, Vietnam has exerted every effort to maintain and promote order in Southeast Asia based on principles of the region and international law, he said. The Party chief said that Vietnam considers the ASEAN as a common home, and prioritises the relations with member countries. He also expressed his hope that Vietnam and Indonesia will join hands with other ASEAN members to continue efforts in building the association.